Geographic location of the 26 Central Asian populations sampled. 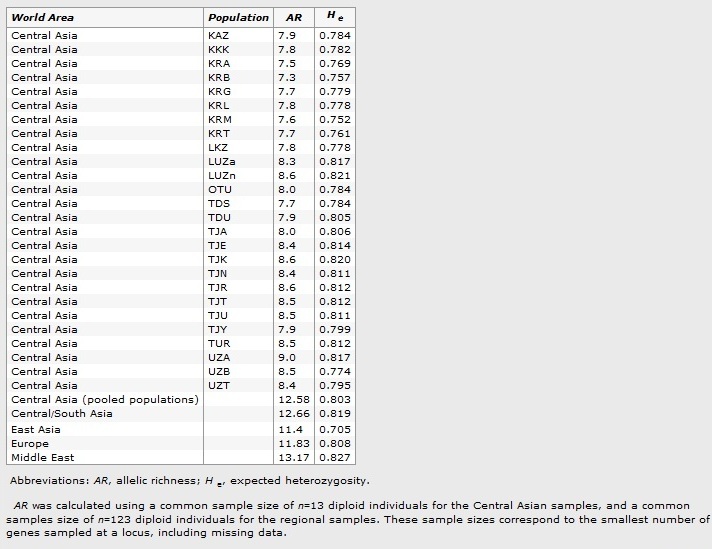 Linguistic affiliation as well as admixture proportions from putative parental origins (Central/South Asia, East Asia, Europe and Middle East) are also indicated. See Table 1 for acronyms. 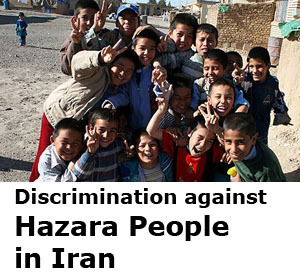 A Central Asian origin of the Hazaras? 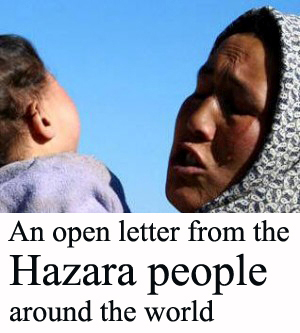 Our study confirms the results of Li et al‘s study48 that cluster the Hazara population with Central Asian populations, rather than Mongolian populations, which is consistent with ethnological studies.49 Our results further extend these findings, as we show that the Hazaras are closer to Turkic-speaking populations from Central Asia than to East-Asian or Indo-Iranian populations. 7Current address: Evolutionary Biology Institute, Pompeu Fabra University – CSIC – PRBB, Barcelona, Spain. 8Current address: Centre National de la Recherche Scientifique – Institut National de la Recherche Agronomique, UMR CBGP (INRA – IRD – CIRAD – Montpellier SupAgro), Campus International de Baillarguet, Montferrier-sur-Lez, France. 9Current address: Department of Human Genetics, University of Chicago, Chicago, IL, USA. 10These authors contributed equally to this work. 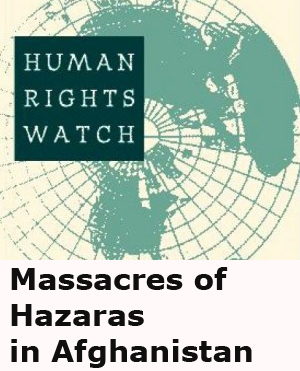 Received 25 January 2010; Revised 21 July 2010; Accepted 5 August 2010; Published online 8 September 2010. Central Asia entered the historical records about 1300 bc, when Aryan tribes invaded the Iranian territory from what is nowadays Turkmenistan and established the Persian Empire in the seventh century bc.8 A branch of those, the Scythians, described in ancient Chinese texts and in Herodotus’ Histories, as having European morphological traits and speaking Indo-Iranian languages, expanded north into the steppes. Thereafter, Central Asia was faced with multiple waves of Turkic migrations, although it is difficult to know precisely when these westward expansions began. Between the second and the first century bc, Huns brought the East-Asian anthropological phenotype to Central Asia.8 At the same period, the Chinese established a trade route (the Silk Road), which connected the Mediterranean Basin and Eastern Asia for more than 16 centuries. In the thirteenth century ad the Turco-Mongol Empire lead by Genghis Khan became the largest of all time, from Mongolia to the Black Sea. 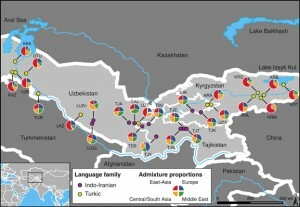 All these movements of populations resulted in a considerable ethnic diversity in Central Asia, with Indo-Iranian speakers living as sedentary agriculturalists and Turkic speakers mainly living as traditionally nomadic herders. 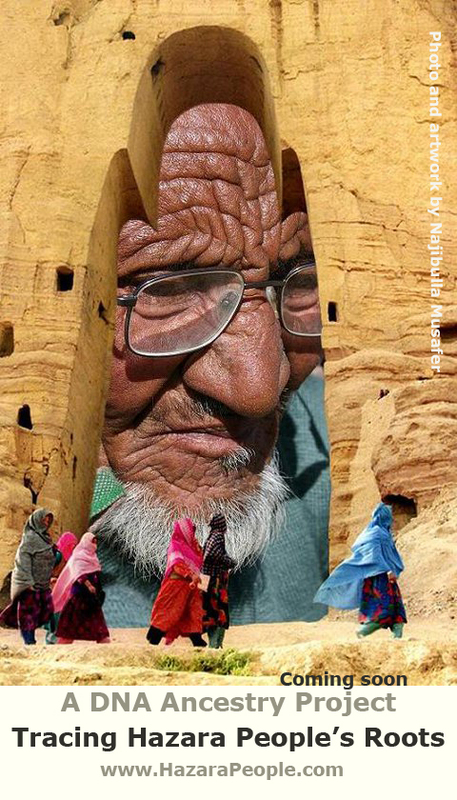 Taken together with the ancient peopling of Central Asia, this intricate demographic history shaped patterns of genetic variability in a complex manner. Most previous studies, based on classical markers,1 mitochondrial DNA (mtDNA)3,9, 10, 11, 12, 13 or the non-recombining portion of the Y-chromosome (NRY),6, 14,15, 16 have shown that genetic diversity in Central Asia is among the highest in Eurasia.3, 6, 15 NRY studies suggest an early settlement of Central Asia by modern humans, followed by subsequent colonization waves in Eurasia,6 whereas some mtDNA studies point to an admixed origin from previously differentiated Eastern and Western Eurasian populations.11 Furthermore, a recent analysis of mtDNA data suggests east-to-west expansions waves across Eurasia.14 However, inferring more accurately the impact of population movements, including the expansion of eastern nomadic groups, requires additional, fast-evolving molecular markers. 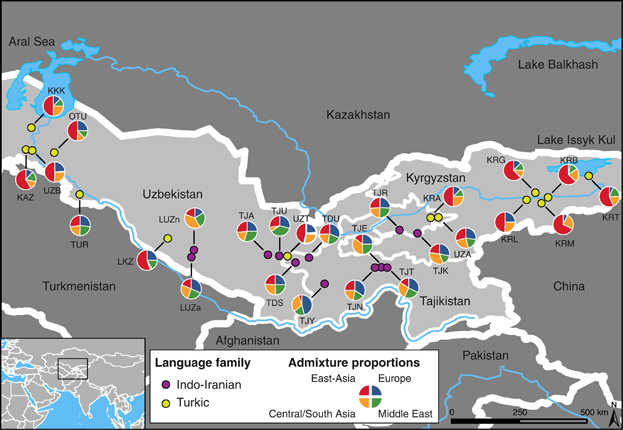 Here we report on the first multilocus autosomal genetic survey of Central Asian populations. Twenty-six populations from six ethnic groups were genotyped at 27 autosomal unlinked microsatellite markers. We aimed to shed light on the genetic origins of Central Asian populations, and to investigate how the recurrent westward expansions of eastern nomadic groups during historical times have shaped the Central Asian genetic landscape. We selected 27 microsatellite markers19 from the set of 377 markers used in the worldwide study by Rosenberg et al.20 The choice and description of markers, PCR and electrophoresis conditions are given in Ségurel et al.19 We further genotyped 20 individuals from the HGDP-CEPH Human Genome Diversity Cell Line Panel20,21, 22 at the 27 microsatellite loci, in order to standardize the original Central Asian data presented here with the worldwide HGDP-CEPH data. Population differentiation (FST) was calculated overall and between pairs of Central Asian populations with GENEPOP 4.0.28 Exact tests of differentiation were performed with FSTAT,24 adjusting P-values with Bonferroni correction for multiple tests. We performed a correspondence analysis (CA) based on tables of allele counts using GENETIX.26 The population structure was also inferred by means of a hierarchical analysis of molecular variance (AMOVA),29 with populations pooled into ethnic or linguistic groups. 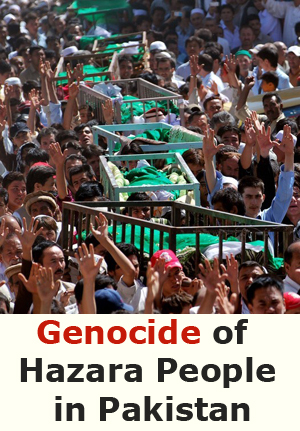 For ethnic grouping, populations were pooled as Tajiks (TJA, TDS, TJT, TJK, TJR, TJN, TDU, TJE, TJY and TJU), Karakalpaks (KKK and OTU), Kazakhs (KAZ and LKZ), Kyrgyz (KRA, KRG, KRL, KRB, KRT and KRM), Uzbeks (UZA, UZB, LUZa, LUZn and UZT) and Turkmen (TUR). 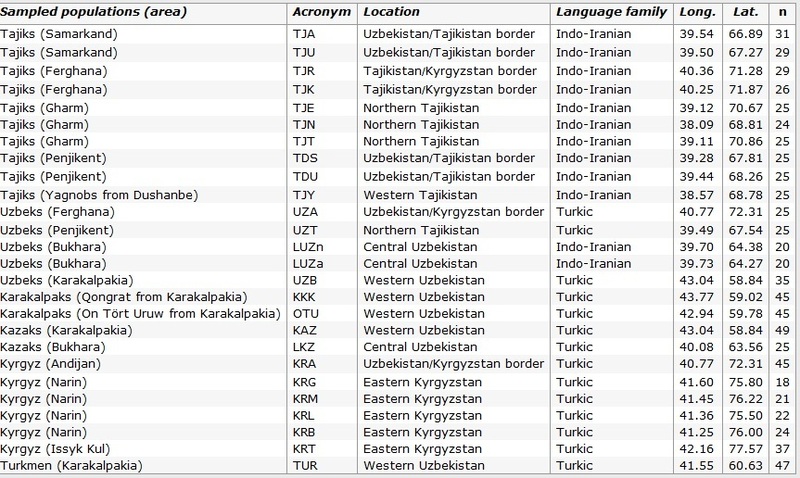 For linguistic grouping, populations were pooled as Indo-Iranian speakers (Tajiks and the two Uzbek populations LUZa and LUZn) and Turkic speakers (all other populations). These analyses were performed with ARLEQUIN 3.11.30Isolation-by-distance (IBD) was tested with GENEPOP 4.0.28 We used PATHMATRIX31 to compute the matrix of effective geographical distances, based on a least-cost path algorithm. The least-cost distances, which account for the cost of the movement through the slopes in the landscape, were calculated from the digital elevation model GTOPO30 of the Earth Resources Observation and Science Center. 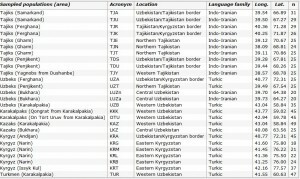 Average AR and expected heterozygosity for each of the 26 Central Asian populations and across regions are given in Table 2. We found a significant difference in AR (Kruskal–Wallis test, ?2=105.29, d.f.=25, P<0.0001) and in expected heterozygosity (Kruskal–Wallis test, ?2=67.98, d.f.=25, P<0.0001) among populations. We found no significant difference in AR between Indo-Iranian (AR=13.8) and Turkic speakers (AR=13.7, Wilcoxon signed-rank test, Z=?0.69,P=0.49), although the expected heterozygosity was significantly higher in Indo-Iranian as compared with Turkic speakers (He=0.818 and 0.787, respectively, Wilcoxon signed-rank test, Z=?4.55, P<0.0001). We found a significant difference in AR across Central Asia, Europe, Central/South Asia, Middle East and East Asia (Kruskal–Wallis test, K=36.46, d.f.=4, P<0.0001), as well as in expected heterozygosity (Kruskal–Wallis test, K=52.94, d.f.=4, P<0.0001). Yet, these differences were rather owing to a lower heterozygosity in East Asia and also slightly higher AR in Middle East (Tukey’s test, P<0.0001 for both AR and He). 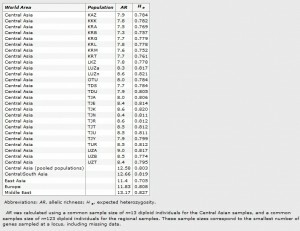 Central Asia therefore showed neither higher nor lower diversity than the rest of Eurasia. 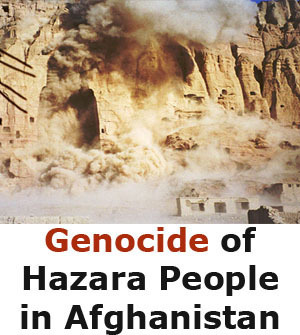 Connection between the Hazara people and the Khazars?